Hot water is a triple whammy for your utility bills. First you pay for the water (water bill), then to heat the water (gas/electric bill), then to dispose of the water (sewer bill). Here’s a step-by-step guide to cutting your losses on all three, while sacrificing nothing. “Go on….”, I hear you saying. Well thank you, I will. Without taking shorter showers, here are the tools you’ll need, and the two devices that can help you save big bucks. Depending on the shower head you buy, you can save almost a gallon a minute over standard showerheads. 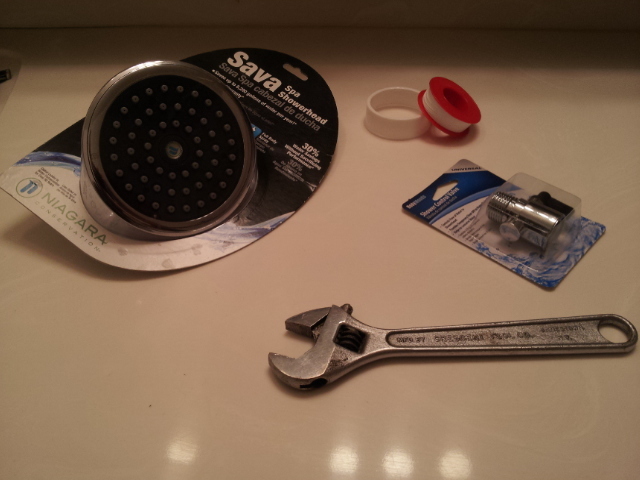 In this case, we used a Sava Spa Showerhead, rated at 1.75 gallons per minute. We chose this one because, well, they sent it to us for free to review for this article. Hey…bloggers don’t get paid much, so back off, ok? We’ll take free stuff when we can, especially when it’s awesome. (No, not kidding. See the “contact us” page for more info). The teflon tape costs a few bucks at the local hardware store and you just use about 2 inches of it to help prevent leaks in any plumbing junctions. Flow valve partially closed–warm water still trickles over you as you soap up, but you spend half as much money. Niiice. Start by removing your old showerhead. The showerhead should be tight at first, but once loosened, should come off with a few turns of your adjustable wrench. Wrap the pipe threads in teflon tape. No need to go nuts. Just once around should do it. It’s just there to prevent leaks through the threads. Put flow valve on, tightening by hand at first, then cranking it down one full turn with the adjustable wrench beyond where your own fingers can get it. The one trick–make sure the lever ends up on top. Otherwise it leaks. More teflon tape on the male threads of the flow valve. Put on the new high efficient showerhead the same way as #3, above. 0.9 gallons per minute saved, times 10 minutes per shower, times 4 people, say, in your house, times 365 showers per year. That’s 3285 gallons per year of heated water that you then pay to flush down the sewer. Depending on your local rates…it’s a lot. Here in Honolulu, we calculated it at almost $200 in energy costs annually, and over $100 in water costs annually. Not bad for a showerhead that costs $25 and a valve that costs $3. Our thanks to Niagara Conservation for donating us a showerhead and saving us a bunch of moola. Check out their energy conservation products and water conservation products.